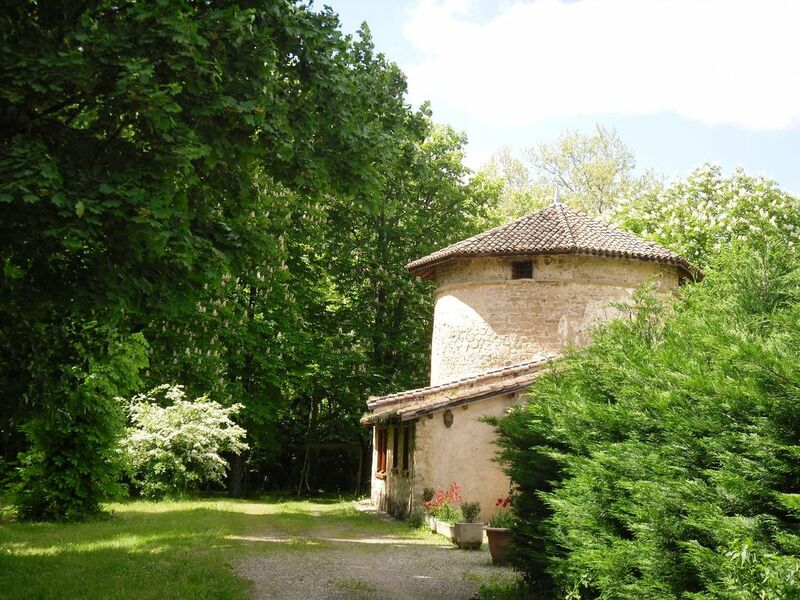 Try an unusual and picturesque experience: this cottage offers sleeping in a sixteenth-century dovecote and fully equipped to live in the adjoining barn to best experience the relaxed lifestyle of the Rhone Valley, couple, family or friends . The pigeon steeped in history bordering a park with old trees has a skylight and offers to the ground floor room with views of its frame and 563 birdhouses included in the walls. The barn is in turn equipped with all modern comforts: washing machine, dishwasher, household equipment allowing guests to make the most of the surrounding nature. A unique property exceptionally well appointed and in a perfect location for visiting Parc de Vercors with it's magnificent views which we loved. Many activities within easy reach to suit everybody. Marianne is an exceptional and generous hostess. Our experience was wonderful and one we will long remember. Beautifully restored pigeonier full of character in a peaceful garden full of trees, with plenty of lovely spaces to relax and enjoy outdoor meals. Marianne has thought of everything to make her visitors feel welcome (homemade jam), the gite is very well equipped and has great recommendations for local things to do. The nearby Vercors mountains are breathtaking, there's the Rhone Valley vineyards and museums of shoes and chocolate! It's a great place from which to explore a relatively peaceful and unspoilt region. historiques avec en plus la beauté des paysages d'une nature variée et préservée. Merci pour ce gentil commentaire. apprécié votre calme et votre discrétion. Our stay at Le Colombier was quite dreamlike for our family of four. This was an ideal place for experiencing the French countryside and was located near many wonderful towns and hiking trails. We loved going for morning runs and evening walks and the cottage itself was just stunning - a beautiful place to relax together, read a book, and enjoy the sound of the cicadas. There was also a large collection of brochures and information to peruse so you could plan activities in the surrounding areas. There are plenty of interesting things to see and do! Highlights for us were exploring the Grotte de Choranche and touring Valrhona's Cite du Chocolat. We also received the warmest welcome from our host Marianne, who made sure that we had everything we needed upon arrival. There were so many thoughtful details that she took care of! In the fridge was our first morning's breakfast (including the most delicious homemade apricot preserves) and a bottle of Rosé. The flowers in the bedroom and sitting room were lovely, and the linens and decor were gorgeous. We felt very much at home and hope to return some day. Some friends of ours have already inquired about staying there themselves. Merci, grand merci pour cette magnifique appréciation. Vous ètes des vacanciers attentifs aux moindres détails et vous avez su apprécier la maison, le calme des lieux et découvrir les atouts de notre belle région. A notre tour de vous remercier pour votre gentillesse et celle de vos enfants. qu'ils n'hésitent pas à se recommander de vous. Quant à vous, nous vous attendons pour un prochain voyage et cette idée nous réjouis déjà. A magnificent and unforgettable stay. Our stay at Le Colombier was absolutely amazing. From the serene, green, natural setting of the garden and Chateau surroundings, to the architectural and interior design of the cottage, to the thoughtfulness placed into every intricate detail, to the attentiveness to guests needs who have young children (baby gate, bed, high chair, baby bath..!) to the warm and gracious hospitality from Marianne and her children. We thoroughly enjoyed our stay, the tour of the Chateau, the colourful and exciting history of the place and being situated in such a stunning location for a week. We would not hesitate to recommend this to any other young family travelling to this area. A great starting point to explore the Drome and Ardeche regions. Mais nous aussi avons été heureux de vous recevoir, vous et vos enfants. Nous espérons qu'ils garderont de beaux souvenirs de leurs jeux en extérieur et des visites dans les attractions touristiques que propose notre belle Drôme. terminées et que, peut-être, nous nous reverrons, un jour. We had a pleasant stay at this beautiful converted buildings. Lots of character, grounds very relaxing, perfect for children as outside space is contained. Sun and shady spots, lots of lovely meals eating out under the trees. Market in Romans is delightful, fresh fruit and vegetables galore; look at the shoe shops. Managed to go for short runs along the local tracks. Marianne and Oliver were very nice hosts, they added nice personal touches that were appreciated. We felt very welcome. Elle est le reflet de ce que l'on peut trouver en Drôme et aussi dans le Colombier. Grand merci à vous d'y avoir été sensibles. Nestled between the Vercors and the Rhone Valley, this quiet oasis offers you the opportunity to discover the Drôme, its nature, its plateaus and rivers, to attempt an incursion in Ardèche or in Isere, and taste some of the best wines of the region. For those who want a ride on the slopes in winter, the resort of Villard de Lans is 55 km. Le ménage de départ est en option. Indiquer lors de l'arrivée si vous souhaitez le faire et rendre le Colombier dans l'état où vous l'avez trouvé ou si vous désirez qu'il soit fait après votre départ ( 50 €) Pour les mois ou le chauffage est nécessaire le montant sera ajouté au montant de la location sur la base de 30 litres de fuel par jour.